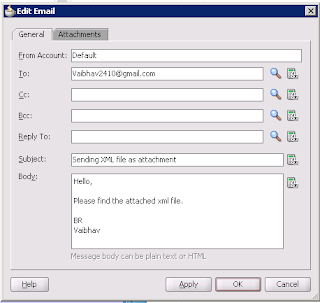 Few days back I got requirement of sending email with attachments. 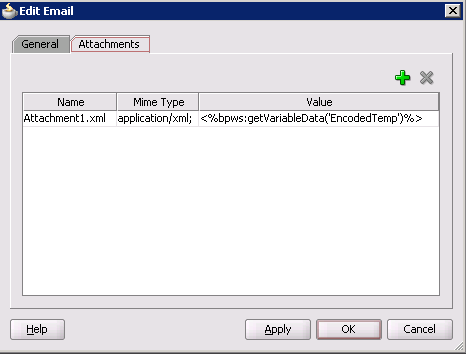 The catchy part of it is sending an XML file as attachment. Thought of sharing the solution. 1. Create a BPEL project. 2. Modify input schema element 'process' to have 'To' and 'AttachmentBody' as string type elements. 3. Insert a Email Activity inside BPEL. 4. Double Click on the Email activity and set / pass values to required fields. 5. Create a Temp variable say 'EncodedTemp' and copy 'AttachmentBody' to the EncodedTemp' using assign activity. To use Java Embedding you also need to import oracle.soa.common.util inside BPEL.